The screenshot on the left is from August 11th. The screenshot on the right is the same URL, same browser and device but August 19th. Building a website or web application, testing it, and deploying for the first time can bring an overwhelming sense of accomplishment for any development team. Testing happens almost in a finite measure, where you can almost account for every marked variable. But with the coming weeks come the inevitable bug reports, edge case glitches, and of course feature requests. With each introduction of code or features deployed to the production server, other functions or elements are certain to break. That’s why running regression tests are incredibly important. When designing and changing your front end UI, visual regression testing is just as important. With CrossBrowserTesting, you can use our automated browser screenshot and side by side comparison features to help conduct visual regression tests on your site or app. Use visual regression testing to develop, test, and deploy quicker. Enter the URL of the web page you’d like to test. Select the browsers and devices you’d like to, or select from the pre-populated lists. Okay, we now have a baseline set of browser tests to compare against once we make our changes. You can now make changes and deploy new features to your test or production environment, and we can run a regression test against that to show where the UI has been affected. To start your test set “B”, go to the screenshot history page. You can do that from the Screenshot Home Page by clicking View All Tests on the left-hand side. Once you’re there find test set “A” in the list. Click run again. You should see the “Start a Screenshot Test” screen and a message above your url stating Repeat Test: This creates a new version of the test and allows changing browsers and options but not the URL. Now click Run Test and wait for the comparison engine to finish running. In the upper right-hand corner click List Versions, then Compare to Previous. You now are looking at the summary of regression tests from test set B to test set A. Click a browser configuration and you now have a side by side regression comparison. 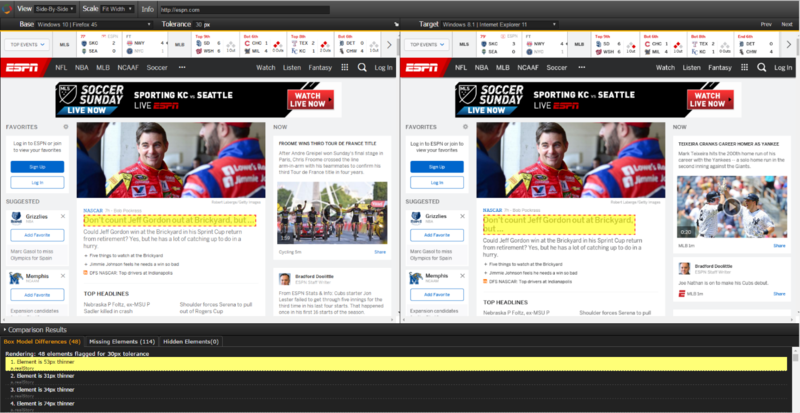 Below is a regression test of ESPN’s Home Page: test set “A” is taken August 11th, and test set “B” is taken August 19th. 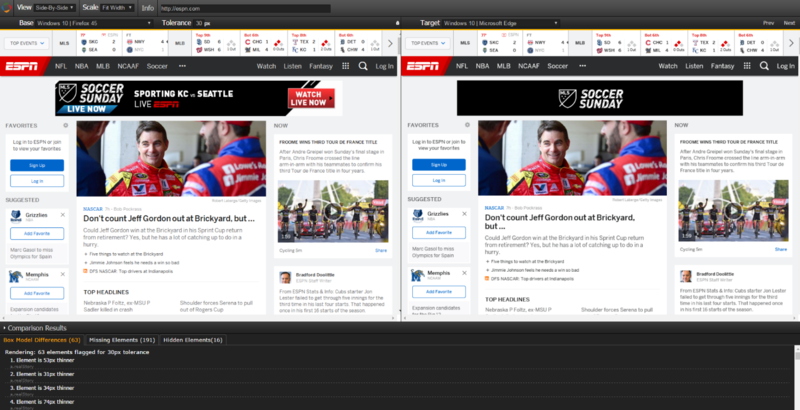 ESPN is a news website, so the differences will be an extreme case, but it is interesting to note even subtle UI changes the website has made in just 8 days. Our Screenshot Comparison engine allows you to see missing elements, hidden elements, and exact movement of elements from set A to set B. The scroll can be locked in both version to quickly see both versions, full-page and side by side – making bug and defect reporting a breeze. One of the challenging parts of designing a responsive site is truly visualizing what your website will look like across platforms. Most of us develop or design on only one or two machines. If you’re like me, a new machine as a daily driver is a pretty big interruption in life and I try to minimize that as much as possible. That’s why our Screenshot Comparison tool is so powerful. Your users are on their main computers too, and their experience is actually more important than yours! When you run an automated screenshot, you’ll be given the chance to select a baseline browser. We’ll run each screenshot against your baseline browser and show you how many elements are hidden or misplaced. This can help increase your test coverage and speed up actual debugging time. Spending valuable time manually testing each configuration is simply too resource-heavy for most organizations. Teams can get to the browsers and configurations that matter with automated screenshots. Once you have your screenshots loaded, click Compare in the upper right-hand corner, and select one of the configurations to run. With the comparison tool, you can easily see how other browsers and devices effect your site’s design against a baseline browser like your main development setup. You can select real devices to truly understand how your website, that you develop all day on your desktop, looks on an actual Samsung Galaxy S7. The comparison engine also crunches up all of your vector points and lets you know what elements may be off. You set the tolerance, and we’ll identify how far off elements are compared to your baseline browser. It will also identify missing or hidden elements based off a browser’s and a device’s resolution. This makes it easy to see when certain lines will break in text, images pushed around advertisements and more. Have you ever thought about how your ad looks like in Internet Explorer? Or how your download button looks on an iPhone. It’s alright if you haven’t, but in today’s mobile lifestyle- this can be the reason for hitting your revenue goals or missing them.